As mentioned last week, rarely does Ives let a measure go by without any thematic material. Here we have two measures to practice our polonaise rhythm before beginning the theme. If we wish to improvise polonaises, we could spend much more than two measures practicing the rhythm. Choose some simple chord progressions and practice the rhythm in different keys. While Ives keeps the rhythmic figure confined to the left hand and pedal, we could also practice it with right hand and pedal or hands alone. Once you have mastered the rhythm, then it’s time to add in the theme. For the first half of this variation, the theme is played by the right hand on a solo stop. If necessary, practice soloing out the theme with a simplified accompaniment first before adding the polonaise rhythm back in. For the second half, Ives requires the left hand to play both the theme and the rhythm. Just as you would probably want to practice the left hand alone if you were learning the Ives, so too, you probably want to practice the same idea with whatever theme you have chosen to turn into a polonaise. The first variation in the Ives set has the left hand playing the harmonized theme, so even Ives gives you a simplified version to practice first before increasing the difficulty level. The right hand then adds some sparkle with it’s commentary. It is interesting to contrast the Polonaise with the first variation Ives offers. Having already practiced the harmonized theme played by the left hand and pedal in a simplified rhythm, rather than add difficulty to the left hand, Ives adds a running line for the right hand to play. He begins with sixteenth notes (basically four notes to each note of the theme), but then doubles the speed to 32nd notes (8 to 1)! The fast motion, large leaps upward and chromatic movement downward make me think of fireworks which seems a most fitting idea for variations on a patriotic song. While these two variations appear to be very different, there are several common techniques that we can practice to advance our improvisation skills. Thanks to registration options at the organ, we could also practice the same ideas found in each of these variations but swapping hands. For example, use right hand and pedal to play the polonaise rhythm while the theme is played by the left hand in either the tenor or soprano register. Play the theme with right hand and pedal while the left hand adds fireworks on a 2′ stop! What if the polonaise was in a major key and the fireworks in minor? What other dance rhythms could you use instead of a polonaise? While not looking to start a revolution today, I hope you are inspired to create your own fireworks while practicing your improvisations! Posted in Information, Lesson, Newsletter. Tagged America, Bastille Day, Charles Ives, France, La Marseillaise, Newsletter, Polonaise. There is no mystique or magic to improvising, just consistent and conscientious practice. It has been said of Jean Langlais that he could teach stones to improvise, and it is true that his own example and his enthusiasm for the art of improvisation were inspiring and contagious. But miracles are as rare in improvisation as they are in any field, and after several decades of teaching improvisation, I have come to rely less on the miraculous and more on clearly laid out exercises and assignments. The aim of this book is to show the student that improvisation is within the grasp of everyone, even those with minimal keyboard skills. To some this might seem like a tiny miracle, but it is achieved by hard work and an encouraging teacher rather than by chance. What an inspirational message for the beginning student! Jan Overduin also explains in the preface his belief that “the traditional comes first, then the modern.” Thus, this book is primarily focused on common practice tonal language. He begins with melody alone, moves slowly through one or two chords, thirds and sixths before arriving at the pentatonic mode. Even though the harmonic language is simple, he introduces contrapuntal concepts early by having each voice play a different rhythmic species. Only in Chapter 29 on Toccata is there any sort of exercise that deviates from tonal harmony (when the right hand is to play white keys and the left hand black keys). Each chapter begins with an explanation of the material to be covered and then provides assignments with examples for further clarification and/or completion. Most chapters have 5-7 assignments, though the chapter on ostinato has 12 and rondo only has one. While each assignment usually grows out of the material that appeared previously, occasionally there are a few larger leaps that might benefit from some teacher guidance or further demonstrations. The examples and assignments are clear enough that they seem quite easy and approachable. A student can most likely follow this book without the guidance of a teacher, but should be careful not to skip over the assignments that seem too easy. While the explanations seem simple, I know that integrating the skills to be able to accomplish the given tasks will take time and practice. In comparison to other methods reviewed so far, this may be one of the best places to start, especially if one wishes to improvise in any common practice harmonic style. Also published by Oxford University Press, Improvising: How to Master the Art by Gerre Hancock, while offering similar clear assignments for each chapter topic, would really work best as a follow up volume to this one, allowing review of the material covered here and advancement into larger forms. Creative Hymn Playing by Michael Burkhardt covers some of the same material as Jan Overduin, but is more limited in what it offers. Breaking Free by Jeffrey Brillhart would also make an excellent second or companion volume to this one depending upon the interests and aptitudes of the student. Many of the assignments in form and structure in this book could be used with the harmonic instruction of Breaking Free. Posted in Book, Information. Tagged Gerre Hancock, Jan Overduin, Jeffrey Brillhart, Method, Michael Burkhardt, Oxford University Press, Review. The St. Alban’s International Organ Festival has included a competition in both interpretation and improvisation since 1963. Previous winners of the improvisation prize include: Martin Baker, David Briggs, Naji Hakim, Jos van der Kooy, André Isoir, and Guy Bovet. 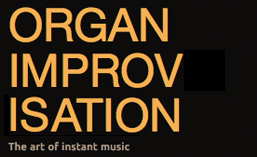 The complete list of improvisation and interpretation winners is available here. Posted in Information, Themes. Tagged Competition, St. Alban's. Richard Grayson (born 1941) is an American composer and pianist. He is best known as an improvisor of classical music, most often with live-electronics. By the 1980s, he was regarded as one of the best non-jazz improvisers (Shulgold 1985). He was also organist at St. Martin of Tours Church, West Los Angeles until his retirement on May 31, 2009, after having served in that position for 28 years. He offers an improvisation handbook for free download on his website here. While not improvisations at the organ, the collection of videos present wonderful demonstrations of different composer’s styles and how themes from one era can be treated in the style of a completely different composer. And this is only a sample!!! Posted in Information, Lesson, Organist, Style, Themes. Tagged Beethoven, Can Can, Chopin, improvelectronic, Khachaturian, Moonlight Sonata, Mozart, Piano, Richard Grayson, Rite of Spring, Singing in the Rain, Stravinsky, Wagner, YouTube. Olivier Messiaen was one of the primary composers that introduced Eastern modes and rhythms to the organ world. In the video below, Willem Tanke shows how an improvisation can be built using two different but specific Indian rhtyhms: Ardha Shikhar Taal and Ardha Jhaptaal. Posted in Information, Style. Tagged Indian, Olivier Messiaen, rhythm, Willem Tanke. As impressive as it may seem to hear one organist improvise, there are occasions where two or more organists gather together and improvise, either one after another, or perhaps even at the same time. Below are a few videos from YouTube where you can see how different artists manage to make this happen. Posted in Information, Style, Themes. Tagged Michael Bottenhorn, Multiple players, Olivier Latry, Paolo Oreni, Vincent Dubois. The 2014 National Convention of the American Guild of Organists will be held June 23-27 in Boston. The convention website with complete information may be found here. Posted in Information. Tagged American, Boston, Competition, concert, convention, French, masterclass, Thierry Escaich. While decidedly fewer in number than competitions in organ performance, there are still a few improvisation competitions that take place. Below are brief descriptions of different competitions with links to the competition website for more information. The competition in improvisation consists of a pre-selection recorded round, two live eliminatory rounds (¼ finals and ½ finals) and a final round. The final round will take place on the great organ in Chartres Notre-Dame Cathedral. The competition takes place every four years with the next one anticipated to be in 2016. The Haarlem International Organ Competition takes place every year in July and is open to organists under the age of 40. A pre-selection recorded round selects eight applicants to compete live in two elimination rounds. The final competition will take place on the Müller organ (1738 / IIIP / 62) in St Bavo’s Church. The American Guild of Organists National Competition in Organ Improvisation takes place every other year during the national convention of the American Guild of Organists. The competition is open to all organists regardless of age or citizenship. Posted in Information. Tagged Chartres, Competition, Haarlem, Information, NCOI. YouTube is a great place to visit in order to see and hear many different organists improvise. Some even have their own channels. Listed below are artists and other YouTube channels that include improvisation videos as a significant portion of their content. Posted in Information. Tagged aristide0cc, artist, chamade216, David Briggs, Jean-Pierre Leguay, Justin Bischof, Nigel Allcoat, Olivier Latry, Paolo Oreni, Philippe Lefebvre, Pierre Cochereau, Playlist, Simon19DK, Theodopolis, Vidas Pinkevicius, Vincent Hildebrandt, Willem Tanke, Wolfgang Seifen, YouTube.